What seemed like a small, inconsequential mistake on a store clerk’s part turned out to be a blessing in disguise for Edgewater resident Oksana Zaharov. The 46-year-old mother of two was shopping in Manhattan in late 2017 when she decided to buy a $1 scratch-off ticket on a whim. The Trisha Convenience store clerk on duty back then, however, handed her a $10 Set for Life scratch-off instead. Noticing the mistake immediately, Oksana felt bad, so she paid full price for the ticket anyway. For two whole weeks, the ticket went unscratched and was being used solely as a bookmark. When Oksana finally decided to use the Set for Life ticket as it was intended—that is, scratch it—she was stunned. 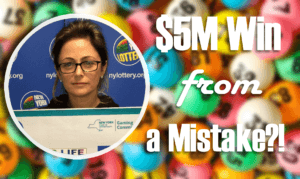 She had just won $5 million from a ticket that she never intended to buy in the first place! Like a lot of people, Oksana had never won anything in her life, so something of this magnitude was hard to take in at first. In her disbelief, she was convinced that the ticket was fake—that is, until she took it to the lottery office, where it was verified to be 100% real. 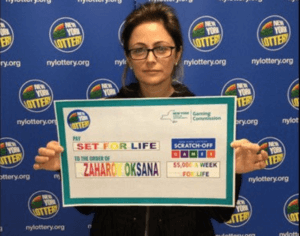 Obviously, it was NY Lottery’s flawless use of WordArt that ultimately convinced Oksana of her win’s authenticity. As for Oksana’s prize, she will receive a minimum of $5 million, guaranteed, over the course of 20 years. That translates to 19 annual payments of $172,068 after taxes, plus one net payment amounting to $39,078 after taxes. And that’s not all! She will also receive annual payments of $172,068 for the rest of her life. Oksana did, after all, win a Set for Life scratch-off. Talk about one lucky woman! As new lottery winners are wont to do, Oksana plans on splurging as soon as she can. She says she’s looking to go on a vacation to the Bahamas with her family. Of course, being a lottery winner doesn’t change the fact that she is a mother first and foremost.